Welcome to Grade 8! I am very excited to be working with your son or daughter on his or her journey through Grade Eight. Grade Eight is both an integral part of your child's education and a fundamental stepping stone to ensure they are successful as they continue their journey into high school. I would like to take this time to breifly introduce myself and express my excitment about working with your daughter or son this year. My name is Heather Lyons and I will be teaching Grade Eight Language Arts, Social Studies and Health here at Springbank Middle School. I hope to create a fun and exciting learning experience and establish a love of learning for your child. If you have any questions or concerns, please do not hesitate to contact me here at the school or to send me an email. Be Prepared - Come to class prepared to learn with an open mind and intention and willingness to learn. Focused - Stay focused on the task at hand as this will help you be efficient. Don't distract others and don't let others distract you. Get Organized - Use an agenda, Google Calendar,etc. to prioritize and schedule school assignments and tests. Ask for Help - Put simply, always ask for help if you need it. I am a teacher, not a mind-reader, so if you are struggling, let me help you. Review - Regular review is critical in order to keep with the course material. "Cramming" before an exam will not ensure you have a comprehensive understanding of the material and will make it difficult to create connections between concepts. Ask Questions - You are in charge of your academic success! Be an active particpant in your learning outcomes. Persevere - Not every concept will be easy to learn, but the things that challenge us are the things that help us to grow. Do not get discouraged or give up. It is important to realize that learning is a process and you are not expected to know everything from the beginning. You are expected to give 100% and stick with it. Mastery does not happen overnight. I believe that parent-teacher relationships are necessary for maximum school success. Throughout the year, I will communicate with parents through telephone calls, emails, PowerSchool, report cards and parent-teacher conferences. I encourage you to contact me if you have any concerns regarding your student's progress. Celebrate - Praise your child’s success, no matter how small it may seem. This will keep him or her enthusiastic about learning and proud of their work. Healthy - Ensure that your child gets enough rest, exercise and a balanced diet. Please encourage him or her to bring a water bottle filled with fresh water daily. Technology - Remind your child to charge his or her laptop each night, so they are prepared to use it as a tool for learning each day. 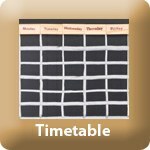 Absence - If your child will be absent please send me an email informing me of the dates of the absence with as much advance notice as possible. This will allow me to make arrangements with your child to ensure they have the required work completed when they return. 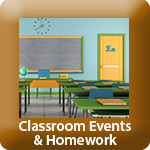 Homework - The homework load will vary throughout the year. There will be a variety of projects and presentations to prepare. If your child has unfinished work from class, it should be completed at home. I am looking forward to working with you and your child in Grade 8!